Labdanum cistus is a shrub that grows in acid soils. Its seeds break dormancy after a fire. Its white flowers with a dark spot only last a few hours. Cistus aroma was known to the Egyptians and the Greeks called it Ladanas or Ladanon (the gum from which essential oil is extracted). It is one of the sacred aromas as other substance like incense (frankicense), cedar, myrrh and benzoin. 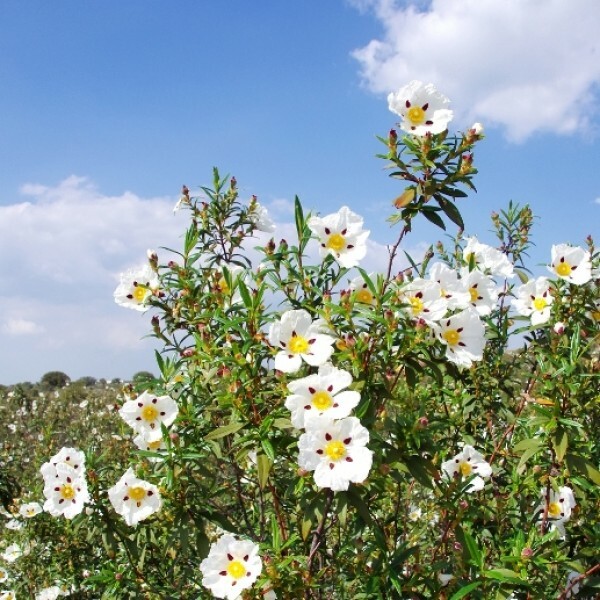 Cistus was used in holy anointing by the kings of Israel, giving them determination and will. Aroma and taste : Described variously as the “smell of an old Rolls Royce belonging to a maharaja” and “dirty laundry”. In other words, some people like it, others do not. It is an unusual fragrance reminiscent of the oil but lacking the complexity and depth, and those who love the oil may be disappointed. Herbaceous, quite dry, and warm in both scent and flavor, it is difficult to describe. Stability and Shelf Life : Very stable. Generally rock rose has a long life, two years or more without problems, but it seems to be greatly affected by seasonal variations from year to year. Oral use is recommended for specific conditions only. This is because of the extremely low pH and cicatrisant (sound-and scar-healing) properties. 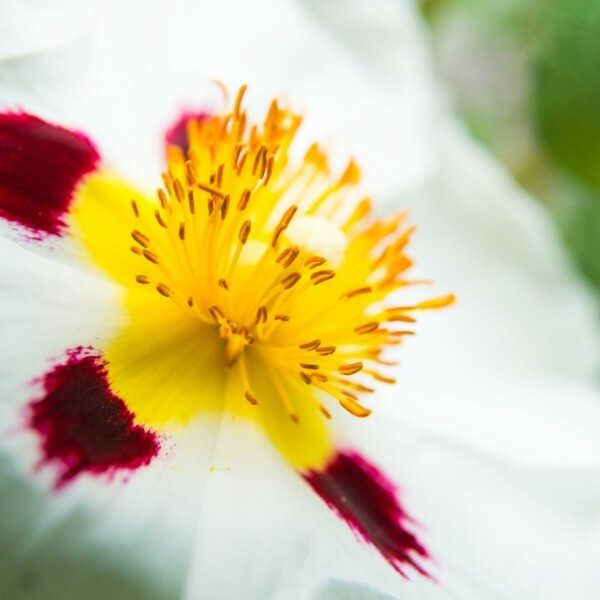 Rock rose supports all types of medicines and treatments and is a good postoperative choice for speeding internal healing and preventing bleeding ulcers, ulcerative colitis, and Crohn’s disease, especially when combined with basil, yarrow, or perhaps angelica. Highly astringent, cicatrisant, and styptic, rock rose hydrosol will stop bleeding almost on contact and is good for cleaning wounds, as a compress for hematoma with bleeding, and for the treatment of new scar tissue. Rock rose is a powerful antiwrinkle treatment when misted on the face two times a day or compressed around the eye area and used in masks and lotions. It seems to exhibit microcluster behavior in the way it plumps cells, smoothing fine lines. Rock rose is a yang fragrance and makes a good aftershave, on its own or combined with German chamomile, calamus, and/or green myrtle. One of the most important applications may be the amelioration of endometriosis, this condition causes severe pain and discomfort, and rock rose is an excellent and powerful douche, especially when combined with helichrysum and yarrow, but to be effective it must be used in a consistent daily program. Cistus taken internally can also benefit endometriosis and heavy menstrual bleeding. Take thirty millilitres in one litre of water daily for five days before the start of the menstrual cycle and continue throughout the period, then stop. Monitor the effects and make notes so you can adjust the dosage to your particular needs and your body’s response. Use more or less as you feel is appropriate – you know your body best. Rock rose is powerfully energetic in its sphere of activity and is healing to mind, body, and spirit in times of emotional distress and shock. It is one of the ingredients in the Bach flower Rescue Remedy.